Sturdy and dependable, this 2019 Hyundai Ioniq Hybrid Limited comfortably packs in your passengers and their bags with room to spare. Tire Specific Low Tire Pressure Warning, Side Impact Beams, Rear Child Safety Locks, Outboard Front Lap And Shoulder Safety Belts -inc: Rear Center 3 Point, Height Adjusters and Pretensioners, Lane Keep Assist (LKA) Lane Keeping Assist. Window Grid Antenna, Wheels: 17" x 7.0J Eco-Spoke Aluminum Alloy, Wheels w/Silver w/Painted Accents, Variable Intermittent Wipers, Trip Computer, Transmission: 6-Speed EcoShift Dual Clutch Auto -inc: SHIFTRONIC and steering wheel mounted paddle shifters, Tires: 225/45R17. 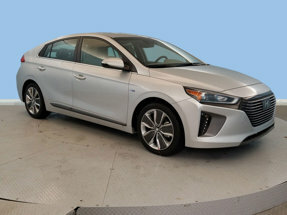 For a must-own Hyundai Ioniq Hybrid come see us at Stevenson Hyundai / Genesis NC015, 2325 N. Marine Blvd, Jacksonville, NC 28456. Just minutes away!